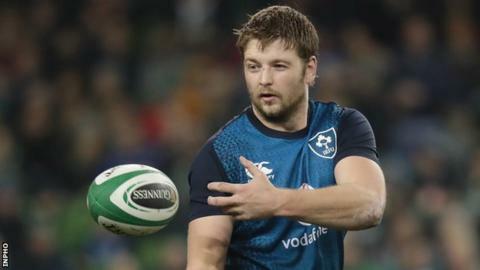 Ulster forward Iain Henderson has been cited for an alleged incident involving Ospreys flanker Sam Cross in last Saturday's Pro14 game in Bridgend. Henderson, 26, completed the entire 80 minutes for Ulster upon his return from a finger injury. The lock is hoping to earn a recall to the Ireland squad for Sunday's Six Nations match against Italy in Rome. He must attend a disciplinary hearing on Tuesday after being charged by the match citing commissioner. In the 15th minute of the game at Brewery Field, Henderson was involved in an attempted clear-out of a ruck, which resulted in referee Quinton Immelman awarding a penalty against the Ulsterman. The second row has been reported for alleged infringement of Law 9.11 - players must not do anything that is dangerous to others - which carries a minimum sanction of a two-week suspension. The disciplinary committee, which will comprise of Roddy Dunlop QC (chair), Ian Douglas and Beth Dickens (all Scotland), will meet in Edinburgh to review the citing complaint with Henderson set to give evidence via video link. Henderson missed the opening two rounds of Ireland's Six Nations title defence through injury but is hoping to regain his place in the squad for the remaining matches against Italy, France and Wales.